In this blogpost I will connect my android device to my VPN server and put the android device in always-on mode. This means that if my phone has got an internet connection it will automaticly connect to my vpn server. This way I always have a more secure connection in public places. So let’s get started. First thing to know PPTP is not accepted in always-on mode. Android will not let you select this one. So we need L2TP. And as I do not have certificates setup yet on the server we will use a pre shared key for now. Connect to the server and open up Routing and remote access. Right mouse click on the server and select properties. 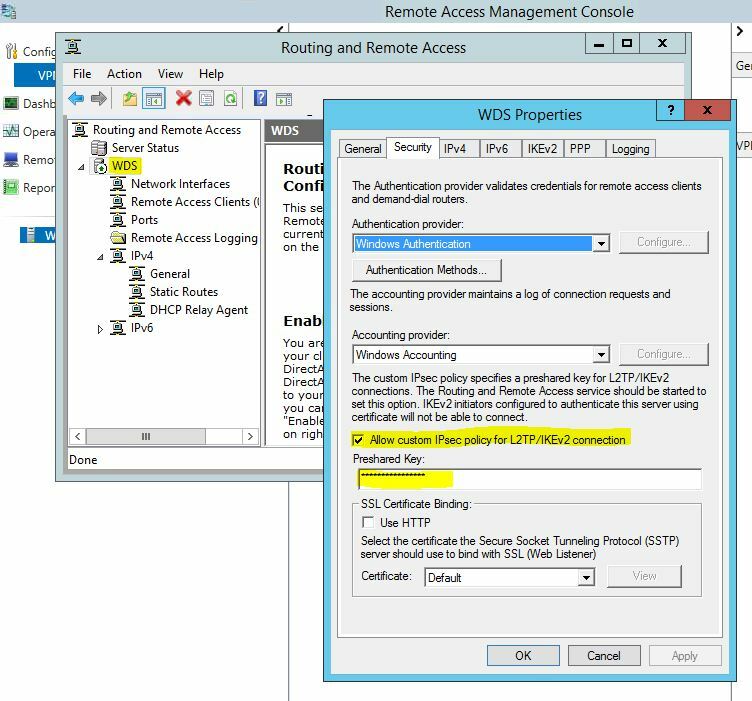 Select Allow custom IPsec policy for L2TP/IKEv2 connections and fill in a key. Can be anything you like. From the VPN screen, choose Menu > Always-on VPN. A permanent notification keeps you informed of the always-on VPN’s status. And we are now setup.